ICE CREAM EMERGENCY is a uniquely themed, mobile ice cream catering business. It’s a full service ice cream parlor on wheels, housed inside a SHUTTLE BUS. The guests go INSIDE the fully-appointed, climate-controlled BUS to be served delicious, hand-dipped, gourmet ice cream and then help themselves to the delectable toppings bar. It’s unique. It’s interactive. It’s mobile. Customers love it. Combine a universally-loved product with a simple, mobile business model, and you have the recipe for success. NO brick & mortar building to purchase or lease, VERY LOW overhead, HUGE territories, and the ICE Bus is easily driven right to customers’ private events – weddings, birthdays, graduations, corporate events, school functions, etc. Events are typically only one hour long, allowing for multiple daily events and high profits. 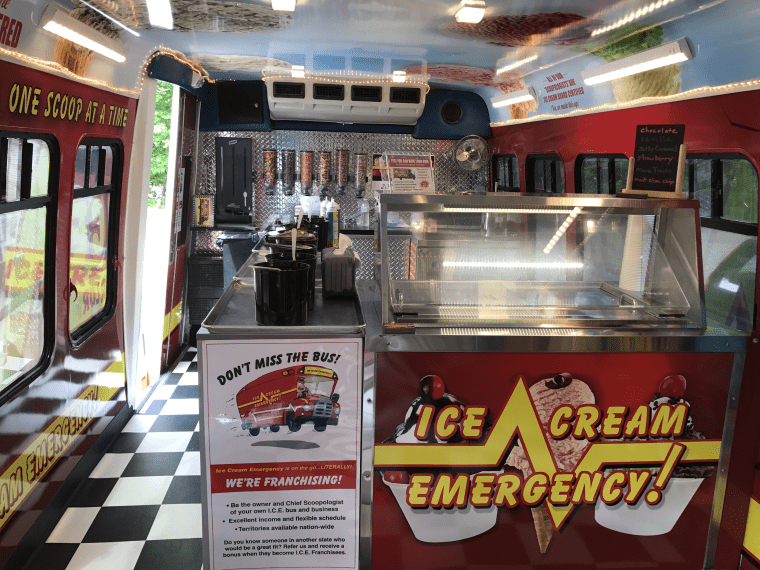 When guests enter an Ice Cream Emergency Bus, they are mesmerized by the rescue-themed decor, the music, the festive lighting, and the fact that they are being served INSIDE a very cool vehicle. They approach the ice cream counter and see all the delicious flavors and toppings. Smiles are plentiful; guests can’t help being happy and loving the interactive experience. We are serious about our tagline: “SAVING LIVES, ONE SCOOP AT A TIME!” We really do make house calls! Utilizing our proven 5-point marketing program, outstanding training, and operations manual, event bookings are plentiful and first-time customers become repeat customers. Take advantage of the “food truck craze.” ICE CREAM EMERGENCY is a unique ice cream catering food truck…with so many added bonuses. Here’s the difference: in addition to the delicious ice cream and the fact that guests are served INSIDE the awesome ICE Bus; a major component of our success lies in the way our customers feel when they board the ICE Bus. There is a certain old-fashioned ice cream fountain feel from days gone by and guests embrace it. Couple this with the fact that our franchisees are trained on the importance of value and appreciation of our customers and this is relayed to each customer as they come on board. World wide appeal –everyone loves ice cream! We are looking for highly motivated “SCOOPOLOGISTS” to help deliver the fun with the ICE Bus and delicious gourmet ice cream! If you want a business where you will be truly happy, love what you do, and can’t wait for the next event, ICE CREAM EMERGENCY is the right choice. You can be a part of our awesome team! We have the “RX” for an incredibly fun, high income-producing business with a very flexible schedule. Complete the Contact Information Form and a member of our franchise development team will contact you right away. Ice Cream Emergency Franchising has relationships with third-party lenders to assist with financing to become an Ice Cream Emergency Franchisee.